For red carpet, for a coctail party or just for everyday use maxi dresses are always an elegant choise. With a maxi dress you feel yourself like a movie star. 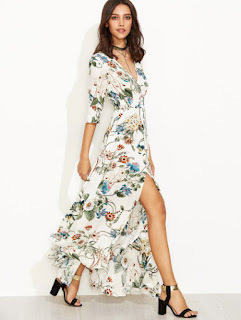 I have a wishlist, with some dresses from shein collection. This wonderfull burgundy dress is absolute perfect for a special evening. Like a Hollywood Star... Red like fire. This simple blue dress is a good choice for everyday use. Flower power. A beautyfull spring dress. Again a spring dress with flowers. I hope you enjoy my wishlist. Which dress was you favorite one?